Using real world maps, locations and objectives in a game can make the progression and achievements feel more palpable, and even more satisfying to a certain degree. Location based games are a rather small niche, but look at the multicultural Ingress community and it’s easy to see there’s no shortage of people willing to play such games. Speaking of, Ingress is certainly one of the most successful GPS-based games that uses augmented reality to transform real world locations into in-game objectives. Less than a month ago, Ingress received support for Android Wear which is great because it’s very playable from the wrist, but what other such games are worth taking a look at? If you ever looked into the genre, you probably already heard of Ingress, or perhaps you’re a long time player searching for a decent alternative. Today’s roundup includes a variety of GPS-based games, some of which involve a lot of moving around (by whichever means you prefer), while others require just lifting your finger (literally). Zombies, Run! 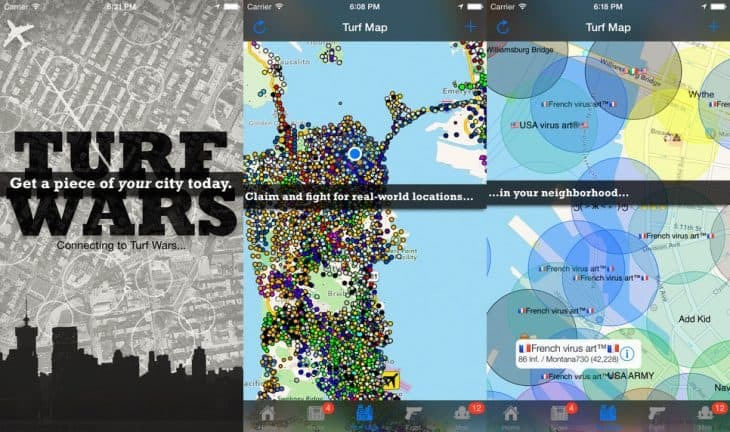 is without a doubt one of the most popular GPS-based games. I know they call this a fitness app, but I think this description doesn’t do it justice. It definitely has a strong emphasis on fitness, but don’t think it lacks a story. If a horde of virtual zombies breathing down your neck won’t make you run, then nothing will. The audio adventure is a great way to become more active, but it’s definitely not for everyone. It went free to play a few months back, although it’s not the kind you could actually play for free indefinitely. However, if this concept motivates you into becoming a consistent runner (it works for many people), it’s certainly worth buying a monthly membership. 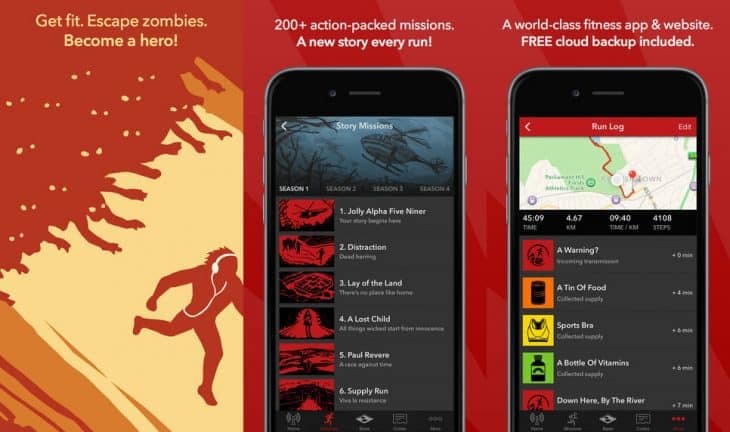 With that said, beginners might want to go for Zombies, Run! 5K Training (Android, iOS) instead since this particular fitness app/game is designed as an 8-week running program that will get you back into shape. I have to admit, I’ve always been drawn to the economical aspect of games (where there was one, of course) and that’s probably why I find myself more attracted to this game than the rest from this roundup. 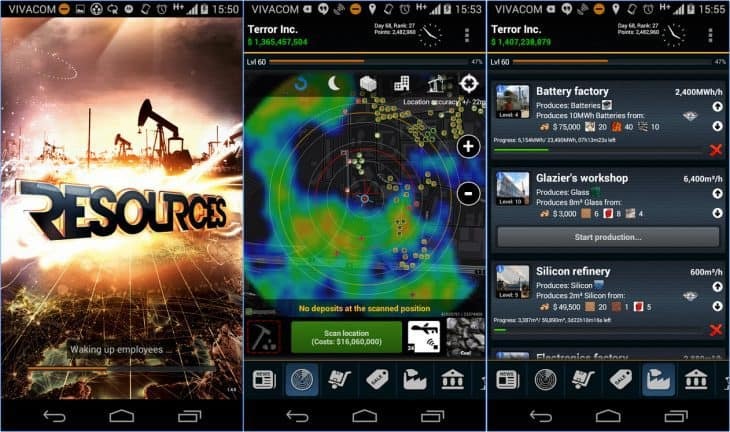 Resources Game is a GPS-based massively-multiplayer economic simulation game, in which you have to scan your surroundings in the real-world to find resources, then extract and use them to manufacture new products to sell. In other words, your smartphone will become a resource scanner and wherever you happen to find some attention-worthy deposits you can build a mine on top of them and start the extraction process. But since this is a multiplayer game after all, competition might show up every now and then. Other players will annoyingly build in your area and even steal your land. The game has it all figured out as you can hire workers to expand your power and even attack the mines of other players (with some risks of course). Resources Game is quite complex so it’s definitely not a game for children but incredibly fun for us grown-ups. The community seems quite enthusiastic, and the game receives regular updates, so check it out if you want a location-based game focused on economy. Geocaching is what stands at the core of many location based games. It lacks a story, but the simple concept is undeniably attractive: community members can go search for hidden containers called geocaches placed by other members in various locations all across the world. The Geocaching community is huge, so if you download the app and look on the map, you’ll probably find a few caches near you. And there are multiple types of geocaches in various difficulties (some can be hard to reach and/or cleverly hidden), so there are always new challenges to take on. 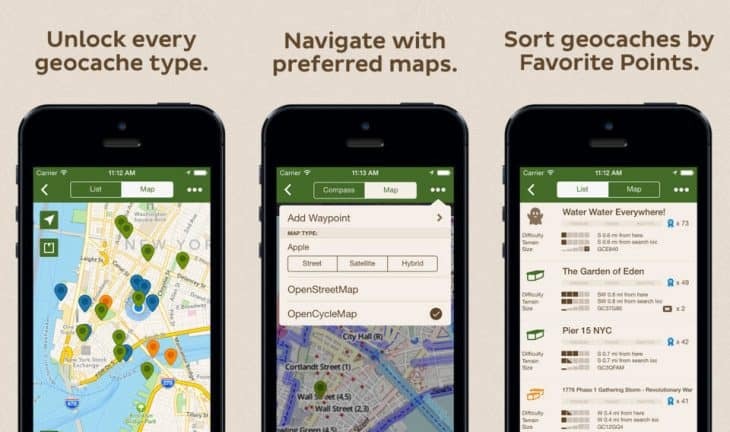 The paid apps offer access to all types of caches and search filters among other perks, but if you’re new to this, the free basic app called Geocaching Intro (Android, iOS), makes a great place to start. 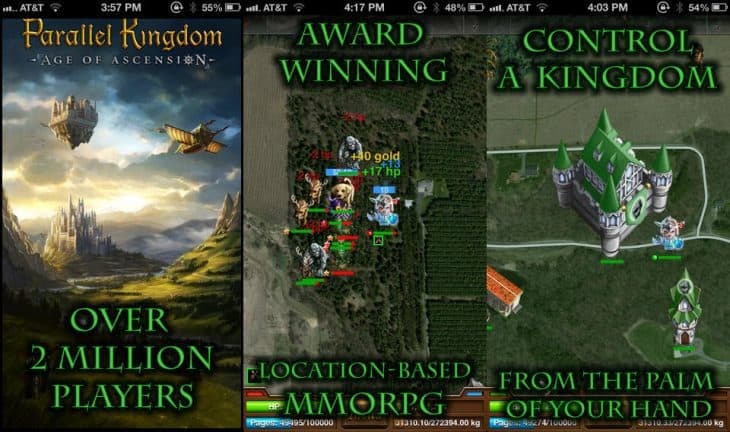 Parallel Kingdom takes the real world map, as provided by Google Maps, and transforms it into a medieval land with dungeons and castles. There are 40 levels, various classes, dungeons, PvP, leaderboards, events, chat rooms and other features characteristic to MMOs. You can definitely play this game without venturing outside your home, but it does translate your real-world location into the game. Go outside in your backyard, to work, or to visit a friend and you’ll end up in different areas of the game, with unexpected critters and enemy players. There’s plenty of stuff to do in Parallel Kingdom since this augmented reality game has been around for a while. However, it hasn’t received an update since fall last year (even further for iOS) so it looks semi-abandoned for now. Here’s hoping the devs won’t give up on it. SpecTrek is an augmented reality ghost hunting game that basically makes you chase imaginary ghosts in the real world. You can play 15-minute, 3-hour or 8-hour games. Ghosts are projected on a Google map in a predetermined or user-defined search radius. Short story: You’ll never get closer to being a ‘Ghost Buster’ than you could by playing this game. The goal here is to get to the location of each ghost and catch them, so it can be really fun to play this with friends or your kids. It’s not a fitness app, but there is a progress tracker, where you can see traveled distance, speed and burned calories. While SpecTrek managed to achieve a certain level of popularity, this is another GPS-based game that’s not getting too much attention from its developers these days. 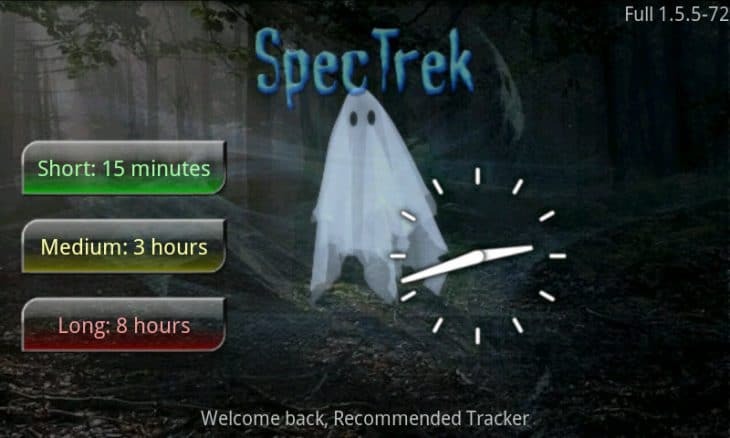 Even so, chasing ghosts in the real world can be fun (at least for a while), so give the free version SpekTrek Light a try, and let us know if you like it. Developed by PerBlue, the same team behind Parallel Kingdom, it’s easy to guess this game is using the same concept, although in a futuristic mafia-ruled world, where only the strongest survive. Just like in real-life, becoming a powerful mobster requires building safe houses and business fronts, as well as taking over territories. Once again, the game’s world is overlaid on the map and centered around your GPS location. Travelling in the game can be done by knowing a real player in that location or physically going there yourself. 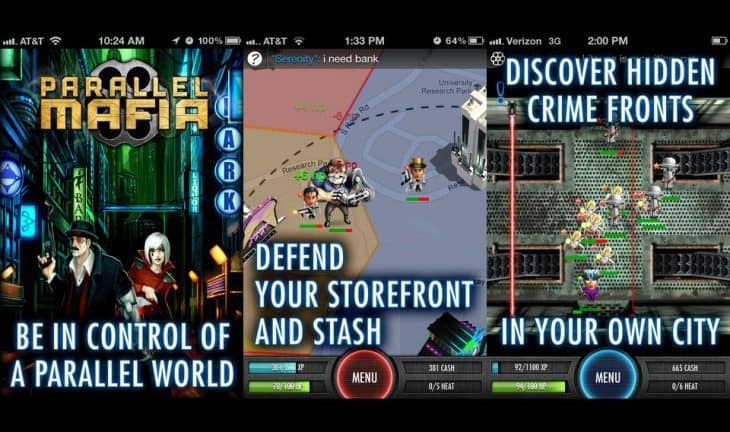 There’s plenty Parallel Mafia can offer: turf wars, business management, trading, manufacturing and team-play are some of the main elements that can let you have many hours of fun. However, it has the same problem like Parallel Kingdom – the lack of updates, which is hopefully only temporary. Turf Wars is similar to Parallel Mafia (or the other way around), as its mafia-based theme requires players to physically travel in order to virtually claim real world territories. The Google Maps-powered game is all about the mobster mentality, so you’re basically going to have to play wisely, especially when you go against, older and more powerful crime lords. Turf Wars also includes a variety of missions, and the money you earn can be used to hire muscle and purchase weapons for your turf. You can also invite other players into your mob – a tool through which great strategic alliances can be made. Since Turf Wars has managed to become fairly popular over the years (especially on iOS), it has a more than decent community that keeps the game entertaining. I’m really not surprised someone though of superimposing the Monopoly game onto the real world map – the combination makes for an interesting location-based game, which works quite well. There are 50 million venues all around the world that can be virtually purchased in-game. 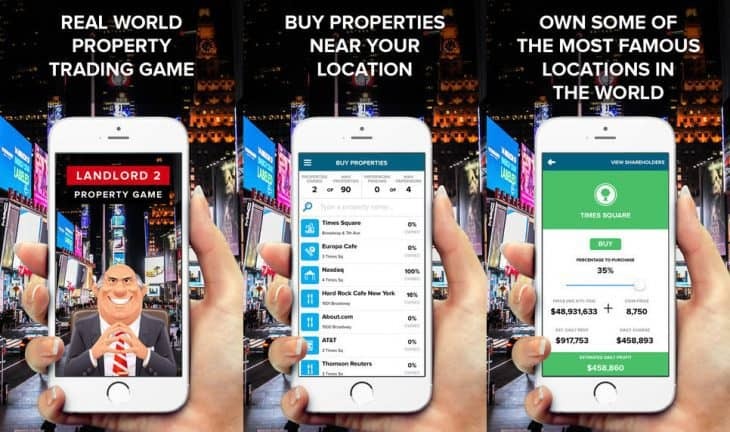 Landlord is using Facebook and Foursquare APIs (so you’ll need an account on either service to play it) making it possible to buy any supported location you visit in the real world. 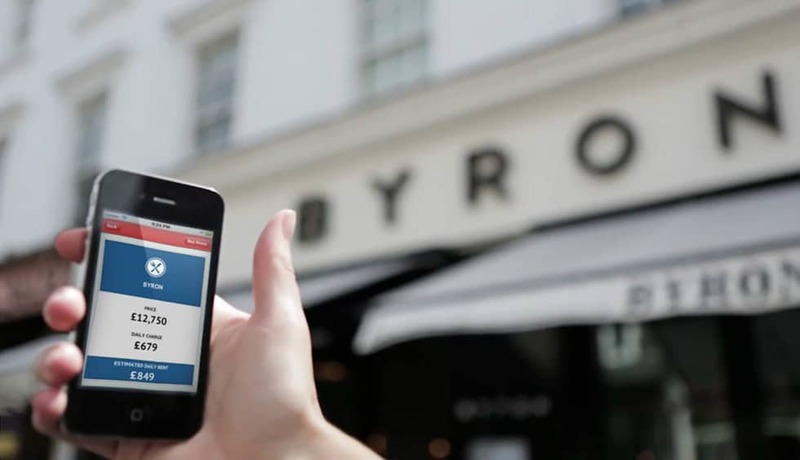 It also tracks check-ins from other people at those properties which is how you earn rent. Of course, upgrades and portfolio management a la Monopoly are all there, so as long as you make the right investments, you have good chances at becoming a tycoon in this game. I think GPS-based games are mostly ignored for now, at least by developers. Looking at popular titles like Zombies, Run! and Ingress It’s clear we have an extensive market for such games, but given the fact most of them make you get up and physically move, there’s little room for error in terms of development. For this reason, I’ve come across many other titles, which are either abandoned or rough, unfinished products because they simply lacked the immersion people require from location-based games – everything is “more” real and so are the technical errors, bad design and lack of content. But enough whining – check them out, try a few, and then come back and share your thoughts with us? Have you found a favorite in this roundup? What other cool GPS-based games do you know? Looking for more awesome mobile games? Check out our Roundups section for our carefully handpicked collections. And don’t forget to follow us on Facebook, Twitter, Pinterest, Flipboard and Google+ to receive our latest mobile how tos, and apps & games reviews for Android, iOS and Windows Phone !